Nashville is buzzing right now, and it's partly down to the TV show of the same name. Showing over here on TG4/More 4, the show is a whirling dervish of feisty women, stetsons and a whole heap of country music. 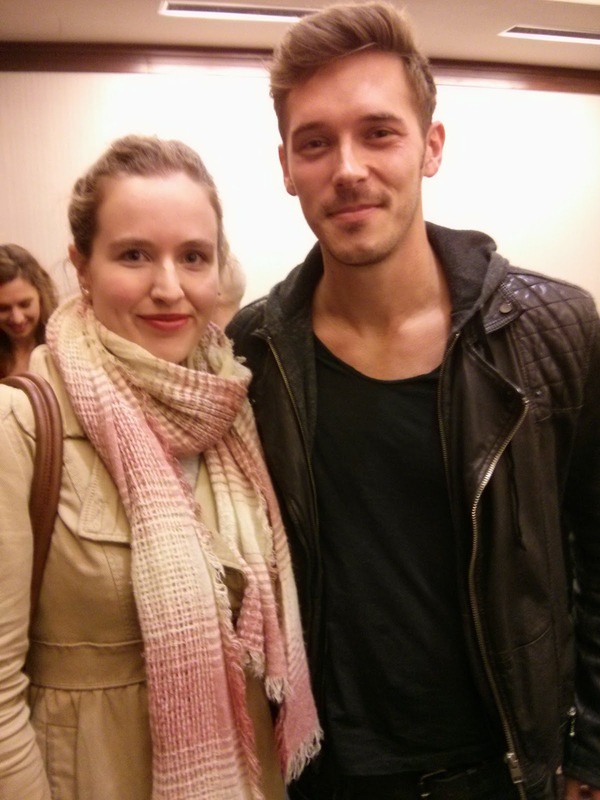 While I was in Nashville, I sat down with Sam Palladio, the English actor playing Gunnar, to talk about the show, his move to the states, and the city itself. "I auditioned on a little old webcam on my cheap laptop in England. I’d just started working with an American manager and it was the first script that she’d sent me that I thought “this could work out – this sounds like a part that’s up my street". "They wanted actors who were real life musicians and had that understanding of the creativity involved in being a songwriter. They wanted that to be real. I didn’t think I had a hope in hell, because it was a massive, American TV show and I hadn’t been here before, so I just filmed myself playing some James Taylor songs and a Tom Paxton song and sent them off and didn’t think much about it. I think it was about four in the morning as well, I stay up late. "Then about five days later, my manager got a call saying "We really love what you’ve done"
"It was one of those fateful moments where they said "We don’t need to see anybody, that’s the guy." "I’ve loved it, I really have. The community is so welcoming. You know, coming from a small town (in Cornwall), where you see a lot of familiar faces, you know everybody’s business, that was my upbringing. And here the southern hospitality is very much like that. So London was great, but I kind of like this community feel here. Even though it’s still a large town, a 'little big town' they call it. Even last night at the CMA awards, all these incredible artists like Brad Paisley came up to me at one point and were like "Hey man, I’ve just got to say I love the show, I love what you’re doing" And then like Vince Gill comes past and is like "Good to see you man!" It feels like it’s so strange that we’ve been accepted in this country music royalty circle. It comes from the locals who are just friendly, and then it extends to the superstars. So it’s been a very easy adjustment, actually. "They didn’t tell me where the character was from to start with, so I did a very general kind of “Hey man, what’s up” Cali accent. Then I got the job and about three days before I got here they said “Oh, he’s from Texas” So last minute flicking back through my old notes from drama school! "I think they were very cautious to make sure the accents weren’t too over the top, so if anything it’s been rein it back a bit. Sometimes you can get real Texan, so the notes have actually been the opposite of that. "I ended up fooling one of our directors who was from Texas. He did episode 9 or 10 in the first season. We were just having a conversation and I asked him what part of Texas he was from and he asked what part I was from. I said "I’m English" and he said "What?!" For some reason he hadn’t picked up on the fact, or our backstories. That made me feel good! I was a big fan of Americana folk and Simon & Garfunkel, Neil Young, Crosby Stills and Nash, that sort of 70s era and then the older country, Johnny Cash, Willy Nelson, that sort of thing. And that tends to be what my tastes go towards. So I really wasn’t aware of the modern day country music, Brad Paisely, Keith Urban and those guys. So getting here was this big education. The first night I went to the Grand Ole Opry, I was like, Vince Gill, who’s this guy? Now, I know exactly who they are! We’re all here. Everybody’s relocated. We’ve bought houses… Chip and Connie have got properties, now moved their families out. Eric Close and I live in the same building over here, he’s brought his family out now. It was very much a relocation for a lot of us. There was talk of it potentially moving to LA at some point… but it’s so well received by the Tennesseans and the Nashvillians that they all fight to keep it here. And I’ll speak for myself, I love being here. There’s a cool one over here called Third and Lindsley. They have some great bands. Mercy Lounge is just round the corner. The amount of people they have on at the Ryman, it’s amazing. I’m playing the Grand Ole Opry this Saturday, at the Ryman. It’s going to be my seventh time. It’s ridiculous, I can’t believe it. I get to play my own music as well, which is an amazing showcase. I thought it was going to be a little more country. A little more like hay bales and tractors and things. I had no idea it was going to be quite so cosmopolitan, and it’s a real melting pot of cultures and people, really. There’s a ton of people that are moving here from LA, and NY, and the south, and Chicago. It’s obviously a mecca for music, so that’s what brings in the artists and the talent, that way. I think that’s why the community is so cool, because the majority of people are creative, here to do a creative job, and that has a cool energy to it. I think it’s been amazing for the city. To open people’s eyes to it. I wouldn’t have had a clue what it was like. I would have had no idea it’s so vibrant, that there’s so much music here and not just country music. Just a wide range of Indie Rock, folk, anything you could ask for. I think the show tries to make the city look good, and I think if I was watching it back in the UK I’d think that looks like a cool place to visit. That’s what people say, and I meet tons of tourists who have come just because of the show. I pop down to the Bluebird Café now and again, and it must be kind of weird for fans who are there. I’ve met loads of fans there that have come to the Bluebird because of the show. A group from Chicago drove down, and the first place they stopped was the Bluebird, and I happened to be standing at the back by the sound board. My buddy Jimmy works there so we’re all just hanging out. We do shows there ourselves, so it must be strange. I can’t imagine walking through Albuquerque and seeing Bryan Cranston dealing some crack, so it’s great! But here, we’re playing gigs and we look like our characters, and it’s funny. And I’m in publishing houses writing songs with people like Billy Montana. And you could just film it, and minus my accent it would just be exactly like the show. You can catch up on all my other Nashville posts here, from my tips on where to eat, to my songwriting adventures with Billy Montana.